Hauskaa lauantaita, tervetuloa viikon Allsorts haasteen pariin! Syksyinen on aiheemme, halutaan nähdä syksynvärien loistoa! Metsästäjät ovat liikkeellä kortissani, kiitos Tainalle inspiraatiosta Korttitalkoissa! Minäpä en nyt lähde metsälle vaan ihan pääkaupunkiin juhlimaan! Hi; Happy Saturday, it's time for a new Allsorts Challenge! 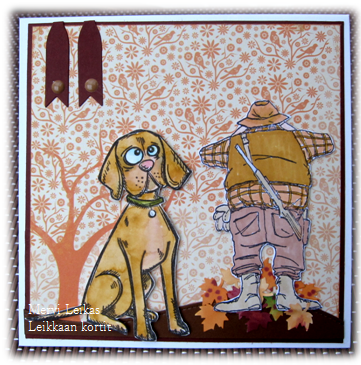 DT Brenda's theme is "Autumn" Hope to see beautiful warm autumn colours! 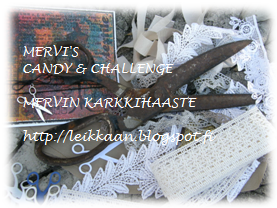 Remember to join in my Candy & Challenge, theme is birthday with numbers! 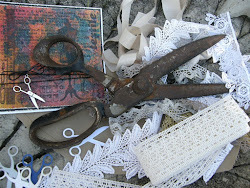 These are such fun cards Mervi and make for a lovely card for my theme this week. Super fun image and two lovely cards. Like the addition of the leaves in the first card. These are both wonderful Mervi!! 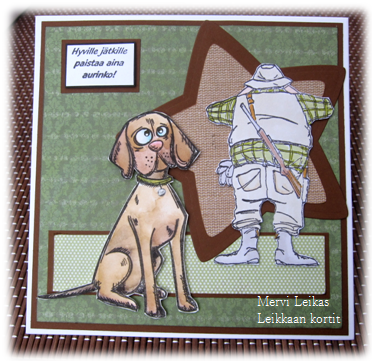 Fun cards, love the dog's expression. Thanks for playing at The Male Room. Great cards, love the expression on the dog's face! Both these cards are so funny. Love the expression on the dog's face!! Super fun papers too. Thanks so much for playing along with The Male Room this week! Deborah, DT.